We’d love your help. 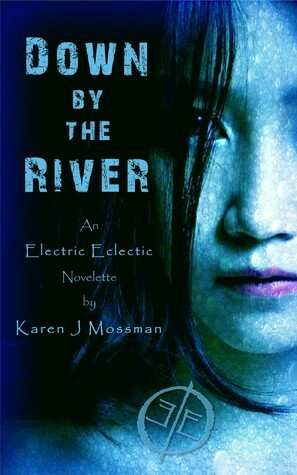 Let us know what’s wrong with this preview of Down By The River by Karen J. Mossman. What happened that night down by the river? When Shelby's best friend goes missing, she has to return to her hometown to search for her. As soon as she steps off the bus, she knows it is too late. Her visions are vague but the sense of foreboding is not. What is Mary-Jo's boyfriend not saying, and why is Sheriff Rawden Hughes so convinced he is guilty? To ask other readers questions about Down By The River, please sign up. This is the first story I have read by this author. For such a short story, it was very deep. The characters were relatable and real to life. I'd love to find out more about these characters. Karen J Mossman did an excellent job of appealing to my emotions and keeping me on the edge of my seat. Only problem - I didn't want it to end. I'm from the "deep south" and this captures the nuances of fringe living well without being stereotypical. This could easily be expanded into a full novel. Sometimes good things come in small packages. This is true of Karen J. Mossman’s thriller Down by The River: An Electric Eclectic Book. From the first paragraph when Shelby steps off the bus, the feeling of impending doom is palpable. She has returned to the small North Louisiana town where she had grown up to reconnect with her childhood friend Mary-Jo. It is apparent the girls relied on one another for support during difficult times. Mary-Jo had been writing letters to Shelby telling her about Sometimes good things come in small packages. This is true of Karen J. Mossman’s thriller Down by The River: An Electric Eclectic Book. From the first paragraph when Shelby steps off the bus, the feeling of impending doom is palpable. She has returned to the small North Louisiana town where she had grown up to reconnect with her childhood friend Mary-Jo. It is apparent the girls relied on one another for support during difficult times. Mary-Jo had been writing letters to Shelby telling her about Ricky, her boyfriend. Much like Shelby and Mary-Jo, he was an outcast, an outsider from the town. Now Mary-Jo is missing and Ricky is suspected of killing her. He had already been a suspect in the deaths of his mother and her lover when their trailer caught on fire and they perished. When she arrives at the trailer shared by Ticky and Mary-Jo, the young man is less than welcoming. He wastes no time in letting Shelby know her friend felt abandoned when the young woman left town. Their conversation is interrupted when the police burst in to arrest Ricky. In spite of his coolness toward her, Shelby speaks up in his defense. Shelby s shocked to discover another person from her past was now Sheriff of the town. Rawden Hughes is arrogant and Shelby is uneasy around him because she “owed him a favor”. Once Ricky has been taken away in a police car, Shelby sets out walking to her father’s house. Her father is an alcoholic who has let his appearance go over the years. It seems he has stopped drinking. Like Ricky, he upbraids Shelby for abandoning Mary-Jo. However, he also tells her she was foolish to return to the town. In spite of her father’s lukewarm welcome, Shelby spends the night in her old room. The next day Mary-Jo’s body is found in the river. When she discusses this with her father he expresses his belief that Ricky killed Mary-Jo. Despite Ricky’s less than warm greeting, Shelby believes he is innocent. She goes to the river where her friend’s body had been discovered and runs into Rawden Hughes. While he admits he hasn’t charged Ricky with the murder, he fully expects him to confess. They speak briefly about the debt she owes him although neither clarifies what he has done for her. Next Shelby visits Mary-Jo’s family. Like everyone else, they believe Ricky is guilty of murder. Shelby makes it clear she feels Ricky is innocent. Avoiding an argument, she makes polite conversation before returning to her father’s house. She is stunned to find her father is drunk when she gets there. As they argue, her father grows more hostile until he tells her to leave. Distraught she leaves the house and begins walking toward town. Soon Rawden sees her as he is driving past and offers her a ride. Shelby hesitates and the debt she owes Rawden along with what happened between them comes to the surface. Just as she resigns herself to getting into Rawden’s car Ricky shows up. As the story progresses secrets from the past are revealed and Mary-Jo’s killer is revealed. This is a riveting story and I couldn’t set it down until I finished. It moves quickly, and the tension builds rapidly. It is a well written and well-paced short story. I highly recommend this novelette and look forward to reading more by Karen J. Mossman. I also plan to read more of the Electric Eclectic Novelettes since I have enjoyed everyone I’ve read so far. A young girl returns to her hometown after a message from her estranged friend. But there is a prevailing sense of sinister lurking in the air. Really enjoyed this emotionally haunting and slightly disturbing tale from Karen J Mossman. So much 'story' in a great novelette. Highly entertaining and highly recommended. Another amazing Electric Eclectic book.